Preparation time: 10–15 minutes. Cooking time: 2–3 minutes per crepe. 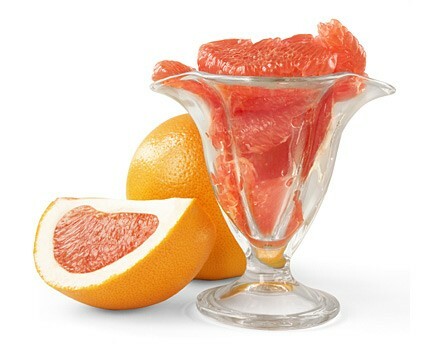 Peel grapefruit and remove seeds and any tough membranes around the sections with a sharp knife. To assemble crepes, lay one crepe on a flat surface such as a dinner plate or cutting board, and place 2 sections of grapefruit in the center of the crepe. Fold the top and bottom inch or two of the crepe toward the center, then roll the crepe starting at one of the sides. Place the rolled crepe on a serving dish. Spoon 1 tablespoon of yogurt on top and spread the length of the crepe. Sprinkle with cinnamon. Repeat with each crepe. Exchanges per serving: 1 starch, 1 fruit, 1 lean meat. Carbohydrate choices: 1 1/2.